Janet’s Film Review of ‘Believe Me’!! Where does your hope lie? In mankind? The government? Your possessions? Your faith? What motivates a person to do something, give their time or money, or fight for what they want? Believe Me explores these questions through the hilarious antics of a quartet of college boys. 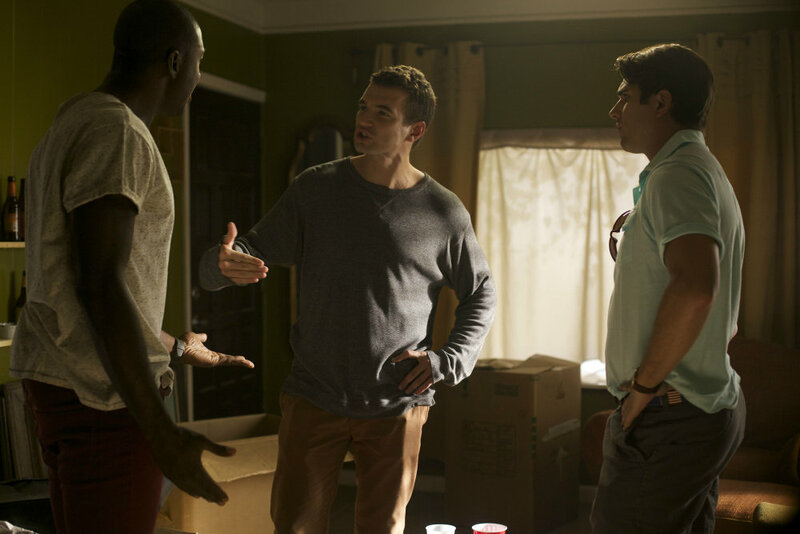 Sam devises a scheme with his fraternity brothers Pierce (Miles Fisher), Tyler (Sinqua Walls), and Baker (Max Adler) to raise funds (which they plan to steal) to fund wells in Africa. Project “Get Wells Soon.” Their first event went fine, too, just not as much money as they had hoped. Ken (Christopher McDonald), the CEO of Cross Country, a touring Christian fundraising organization, approaches the boys. The company has a strict 100% donation to the cause rule; does this stop the boys’ embezzling plan? Oh no, they decide to step up their game and study their prey. Sam proceeds to dissect the Christian lifestyle. What does a Christian say and don’t say? How do they worship? Wait until you see the “Gecko,” the “Straightjacket,” the “Casual Five,” and the “Shawshank.” Would you wear Cross-dressing? Let the games begin. Believe Me is a good film. The cinematography is visually cool. From the opening with the title shot, the word “lie” flashes out of Believe. The use of slow motion turns beer into shimmering streamers at a party and faces into surreal Play Doh images. At first, the plot can seem intent on offending Christians. However, I think it pokes fun at the actions of “church people” copied from actions originally done by people who believe. Believe Me is honest about the progression of the “Christian” lifestyle. Within the film’s confines, there is a message and I sincerely hope it is not lost in the mockery. Don’t miss the forest for the trees. Even as a Christian who truly believes in the Lord, I enjoyed Believe Me and laughed often. Not because of the mocking of Christian lifestyle, but because I have a sense of humor. Unfortunately, it is in limited release. So, hurry, two weeks at Highland Park Village Theater and a short stint at Grapevine AMC. Film Review: ‘Earth to Echo’!! Film Review: The Mummy (2017)! This entry was posted on Friday, September 26th, 2014 at 8:36 am	and is filed under Film, News. You can follow any responses to this entry through the RSS 2.0 feed. You can skip to the end and leave a response. Pinging is currently not allowed. « Will The Wyld Stallyns Be Heading To Big Screens Soon?!!! What are you guys gawking at? Get that president outta here!